Two of my favorite herbs are rosemary and thyme. These aromatics are heaven for my nose, and I wish that I could find a way to incorporate a "smell-o-meeter" into our blog. As we came back from the market this eve my husband says, "Wow that smells really good! Is it coming from our place?" "Of course!!" 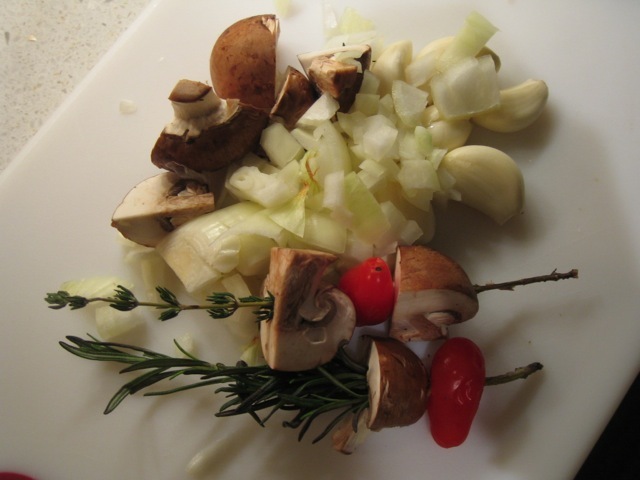 I said,  "It is my rosemary & thyme kabobs! In a baked chicken dish we made this evening, I took advantage of these fresh little sprigs, and decided to use them as kabobs for the onion, tomato, and mushroom going into the dutch oven. In a future dish I will try adding some steak to this, and put them on the grill with a little olive oil - yummy!